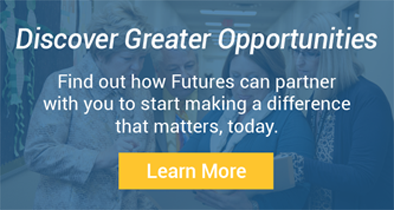 Futures Education, a national leader in special education services and resources, provides a comprehensive array of expertise from clinical and educational assessments to professional development, to professional staffing for school systems and alternative education programs. Our team of experts conducts an in-depth analysis of current caseloads, documentation systems, staffing patterns, schedules and overall delivery systems, as well specific strategies for improving service delivery to improve outcomes and maximize financial resources. Our experienced team includes leaders in their fields who have developed and extensive curriculum for addressing response to intervention, co-teaching, best practices related to Least Restrictive Environment and Free and Appropriate Public Education, and more than 180 other professional development programs offered in-person and electronically. Futures Education partners with schools to provide direct support, coaching and mentoring to staff to improve outcomes, maximize synergies and reduce costs. For efficiency and effectiveness, Futures Education provides services under an “umbrella” that provides a single point of contact that ensures all requirements, goals and budgets are met. Futures Education offers an array of special education services for school improvement programs in public, private, and charter schools of all sizes in rural, suburban and urban settings. Futures Education develops a wide variety of custom special education programming ranging from early childhood intervention to support services within the juvenile justice system. The Futures Education staff offers a very clear, direct and personalized evaluation process. The time and care invested in thoroughly understanding our issues and concerns was clearly evident in the resulting accuracy and appropriateness of the evaluation and recommendations. I would highly recommend their services.